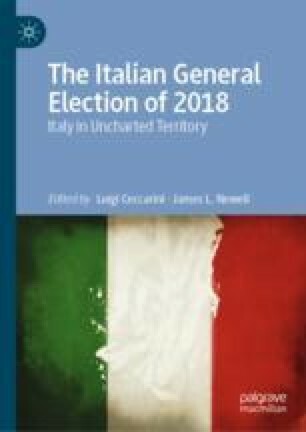 This chapter argues that explanations of the outcome of the potentially landmark election of 2018 require reference to general factors, including but going beyond Italy, as well as to factors specific to that country. And, as in the case of any election, the outcome (conceived as the shift in the distribution of parliamentary seats and therefore of power among parties) can be analysed by reference to the operation of three sets of factors: those that will explain the specific configuration of the parties and party coalitions among which voters are called upon to make their choices to begin with; the social and political events and processes driving their choices; the rules governing the translation of given vote distributions into given seat distributions. While none of the three can be analysed in isolation, in describing the long-term developments associated with each of them, the chapter provides an interpretation of the outcome that is organised in terms of these three categories. Banca d’Italia. 2018. Survey on Household Income and Wealth—2016. https://www.bancaditalia.it/pubblicazioni/indagine-famiglie/bil-fam2016/index.html. Lloyd, J. 2012. Beppe Grillo: The Anti-politics Politician. http://blogs.reuters.com/john-lloyd/2012/05/17/beppe-grillo-the-anti-politics-politician/. 17 May. Pasquino, Gianfranco, and Riccardo Pelizzo. 2016. Qual’è il parlamento piú produttivo? Casa della cultura. http://www.casadellacultura.it/431/qual-e-il-parlamento-piu-produttivo-.